Thanks so much again, Jakob! What an information packed video! How did you visualize the sound on the second iPad? Which App and how did you connect all of this? Blimey, this has nearly knocked me off the fence. Very nice sounds coming from that thing. @sch @Telstar5 @MonzoPro Thanks Guys! Im happy y’all liked the video. The iPad mini 2 is running “Oscilloscope” by Onyx apps. I’m porting the audio from my iPad Pro 12,9” via the headphone port into a Behringer UCA-202 connected to the iPad mini 2. Brw, I freaking love headphone ports! Headphone ports are such a cool invention. I really wish more devices would have them! Your video is seriously tempting my wallet though! wow i had no idea how great this synth is. i’m gonna have to buy nano studio 2 i think. is obsidian an in app purchase? or does it come with nano studio 2? @eross It comes with it. @eross its included. 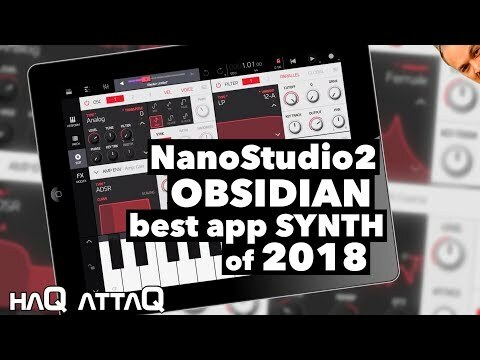 To quote Matt Borstel from the video ”Obsidian is the work horse synth used by the app”! He really packes that thing full so that it would have everything one needs for any type of production needs. I serioudly live that one can mix sampling and synthesis together! The multiple macro destinations on a single knob looks cool. Does any other iOS synth have that? i bought it, i love it already, and i just started digging in. however is there any other way to record audio into ns2 other than external mic. i tried from my normal iconnect audio interface but it doesn’t show up in the inputs list? @eross any audio interface should work, i use focusrite dock..
@jakoB_haQ totally awesome video - watched it twice and enjoyed it a lot - even throug i live with obsidian for 4 years :-)) Great job ! BM3 goes two steps further in that it offers you to adjust fixed value ranges for destination parameters and the possibility to macro-control any synth AU plugin parameter that is available. iTuttle has two X/Y pads that can be mapped to any parameter, including amount and polarity, using up to 8 modulation slots. This is not to degrade Obsidian in any way. The synth engine, including the sampler with in-app sampling and up to 3 velocity layers is absolutely superb! Just the right depth for my taste. One thing regarding limits in number of slots in mod matrix which you mentioned in video. What if i tell you, that There is way how to set macro modulation without need to use mod matrix slot for it ? Check that multiplier parameter in mod matrix. This parameter significantly expands modulation posibilities. What it does ? It means, that if you have some source > destination modulation set, that multiplier affects how much that modulation is actually applied. It means, if multiplier is 0, it is like NO modulation, if it is 100%, it's like it is fully modulated based on source > descrination set amount. 2/ OR - you locate "filter envelope > filter cutoff" modulation slot, and you add "kbob" as MULTIPLIER to that modulation - now, if kbob is 0, there is NO envelope > cutoff mod, if kbob is 100, there is full env > cutoff mod. I'm angry on myself that i did not understand this concept sooner, i would use it a lot during working on factory patches. It's pretty powerfull feature. Think about fact that you can use as "multiplier" ANY mod source not just macros. It means you can basically use TWO MOD SOURCES per single slot for affecting destination. And think also about this: You can fill all mod matrix slots with various modulations, and THEN you can take SINGLE knob and assign it as multiplier to ALL those 24 modulation slots, so with ONE knob you will be able to alter amount (in various directions and amounds of course !) of ALL those 24 modulations !! Did you think that Obsidian modulation possibilities are insane before ? Ok, now think about this ! This is basically possible also in NS2. You just need set modulated value in edit page to initial value of range - because macro knob basically adds (or subracts) to/from default value of modulated destination parameter. For example if you want control CUTOFF just in range , let's say from 20 to 65, you set initial value of cutoff to "20" and then macro amount modulation to "45" - now you marco is changing cutoff in range 20 - 65. .. Or if you want change cutoff from 80 to 15, you set initial value to 80 and macro modulation amount to -65.
macro-control any synth AU plugin parameter that is available. @dendy: Good to know, thank you for elaborating! I can't find any info on multipliers, is there a proper pdf manual that I probably don't know of? I might have to drop the cash for this bugger over the weekend. Damn. Think about fact that you can use as "multiplier" ANY mod source not just macros. My wrong, actually you can use just macro as modifier, sorry for misinformation ! aghhh very cool. i’ll have to dig in more maybe i missed where to change the inputs or something. It's very simple - Nanostudio uses as audio IN/OUT your connected audio device. 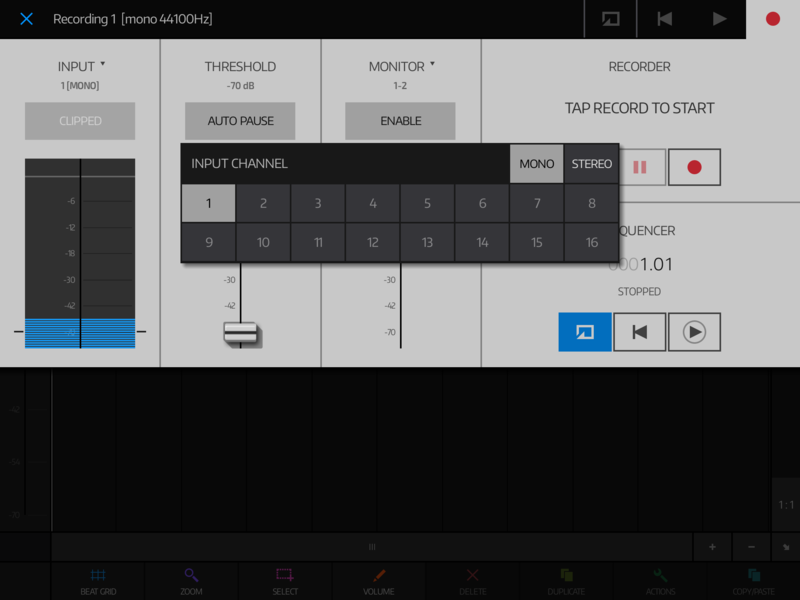 You can select input during recording, in record screen .. that numbers represents HW INPUTS of your audio device .. In recording screen just tap in "INPUTS" select box to choose from where you want to record stuff. yes, actually this is something which is currently under developement, first BIG update (after upcoming small update with some fixes and things like audiobus support) would be universal app, if nothing would go wrong then somewhere during spring.